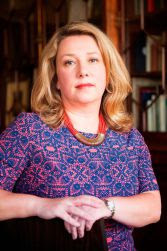 Eleanor Oliphant is a bit of an oddball. She doesn't fit in with her work colleagues and has no social life. She lives for the weekends, at home by herself, binging on pizza and vodka. Her life is one of routine and that's just how she likes it; she's completely fine. When Eleanor and colleague Raymond witness an old man taken ill in front of them, they step in to help. This single act of kindness forces Eleanor to re-evaluate her own life. But the question is, will she be able to embrace change or should she continue being just 'completely fine'? Oh my goodness, what an absolutely brilliant book! I can hardly believe this is the author's debut novel. It's uplifting, it's desperately sad, it's laugh-out-loud hilarious, it's enchanting. 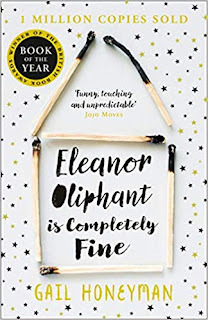 Eleanor Oliphant is an enigma in her own lifetime and I absolutely loved her! Definitely not my usual sort of read but after hearing such good things, I had to see what all the fuss was about. 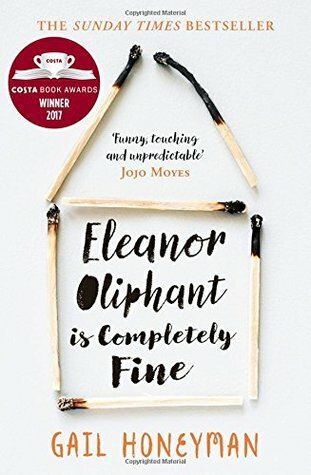 What an amazing character Eleanor is. I experienced every possible emotion as I accompanied her on a journey of discovery and reinvention. I finished the book thinking it's OK to be eccentric and unconventional. It's OK to not follow the crowd. But what is NOT OK is to be without friendship or acceptance. This is a wonderfully heart-warming book and I enjoyed every second.